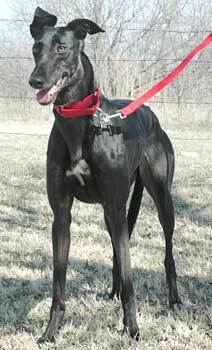 Carmel, aka Carmel Twist, is a 3-year-old black female born October 3, 2002. Carmel's sire is San Tan Rebel and her dam is Powder Puppy. Her racing career consisted of 20 races, all held at the Southland track in West Memphis, Arkansas. 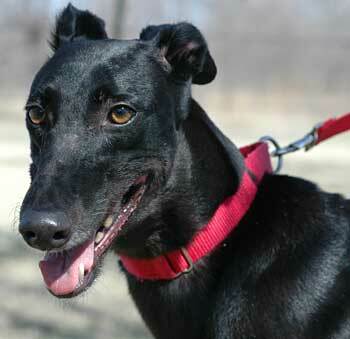 Carmel's shiny black coat may not have inspired her name, but her liquid brown eyes clinched it. A little bit shy, but not overly so, this quiet little girl is certain to rank as a top-notch companion. Carmel is cat tolerant.